There are three main components to the Mimo system: The kimono onesie, an attachable low-energy Bluetooth Turtle, and a Lilypad WiFi base station and charger. All three connect: The kimono’s non-contact machine washable sensors help monitor your baby’s vitals, the chew-safe Turtle sends the information wirelessly to the nearby Lilypad, and the WiFi Lilypad beams the info to your iPhone or Android device. The Lilypad also has a mic, so all your baby’s sounds can be streamed as well. There are a lot of similarities between the $199 Mimo system (3 onesies, a Turtle, and a Lilypad) and the $250 Owlet activity-monitoring bracelet Techlicious covered back in September. 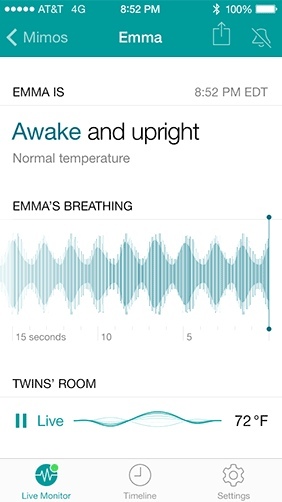 One cool bonus feature of the Mimo, however: The Lilypad has a built-in mic, so not only is Mimo a vitals monitor, it doubles as a standard baby monitor as well.